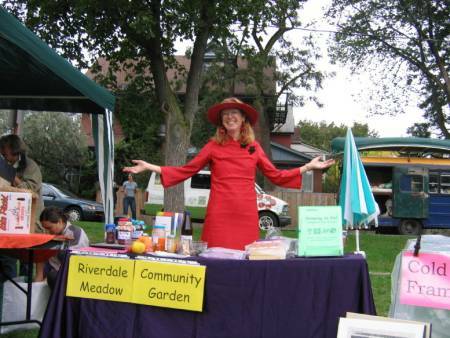 Welcome to Riverdale's community garden's website ! We once loved to welcome you in person at the garden, or to say hello at fundraising events; however things are currently changing for us; and we now respectfully ask for your continuing patience as new entities are negotiating to assume responsibilities and reconfigure the garden. For potential future participation, please 1/ first visit the Membership Information pages; and then 2/ contact rmcommunitygarden@sympatico.ca to have your name added to the waiting list. We will forward your contact information once we receive notice that the garden is re-opened. Thank you. We grow and share all vegetables, herbs, berries, and catnip on a communal basis. Shares in the produce from these areas are relative to the work invested in maintaining them. Gardeners share in the work of maintaining all areas and aspects of the garden. An herb garden is currently in development. We grow a mix of flowers, preferably Ontario Native Species, but some varied bulbs and seeds as well. These attract birds, bees, and butterflies to enhance the natural eco-system of the garden. Fresh, organic produce is also donated to a local mental-health crisis centre's kitchen, under inspiration of the national Plant A Row ~ Grow A Row program which encourages donations to food banks. We donate directly to a kitchen so we can speak with the cooks about our heritage produce, and so these tender items are used that day, with minimal transport and handling. 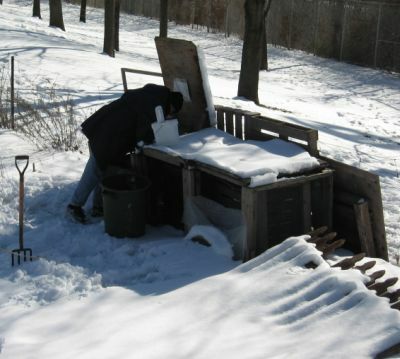 The compost bins for fruit and vegetable peelings, coffee grounds and tea bags, stale baked goods, and other kitchen scraps are maintained all year round. The garden's member-volunteers and neighbourhood folks living in apartment buildings can bring their kitchen scraps to our bins. The resulting green gold is used in community plots to nourish new growth. 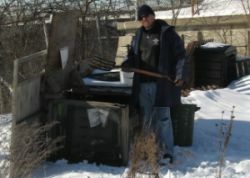 We have also maintained a large, open, Hot Compost Pile (foreground, under fencing) that reduces the garden's larger vegetation matter (tomato plants; potato tops; jerusalem artichoke stalks; swiss chard roots; and pea, cucumber, or squash vines) into a nutrient-rich humus to add to the clay-like soil in garden plots, creating better tilth in which to grow. The interdependent cycles of growing, uprooting for decomposition, and eventual re-using are elemental, essential, complimentary aspects of gardening. We have neither facilites, staff, nor funding for trucking waste away from our site - and that is as it should be - composting is a natural and effective practice that is part and parcel of organic growing. Fall 2006: Gardeners share information with Withrow Park visitors about community gardens, organic growing practices, saving seeds, and season-extension techniques. 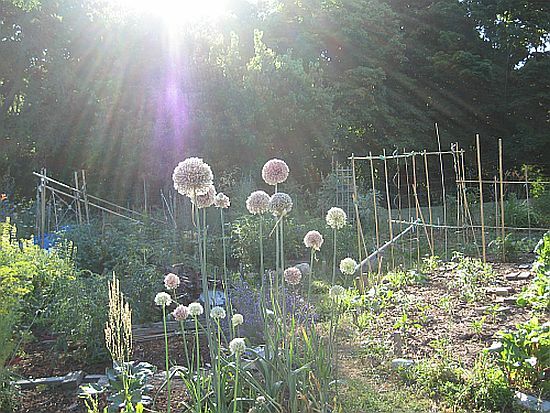 Events outside the garden, such as teaching gardening classes, hosting plant sales and fund raising activities, donating perennial food plants to other gardens, and donating fresh organic produce to a local crisis centre are regular practices in which our volunteers participate. 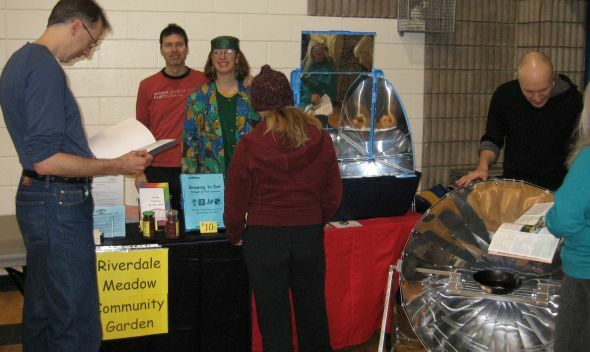 Gardeners staff a table at Toronto's Seedy Saturday in support of Seeds of Diversity. Representing community gardens; sharing information on growing and preserving foods; arranging trades with other gardeners; demonstrating Season Extension Techniques; and marketing Solar Ovens: our gardeners have a wealth of experience to share. Seedy Saturday is an annual nation-wide grassroots event focusing on organic, heritage, and heirloom plants, in support of Seeds of Diversity Canada. Each spring, see the Events page at seeds.ca for all events, listed by date, for all of Canada. The content of every page on this website -- both text and images -- are (c) Copyrighted, 2006-2019 and beyond, under Canadian Copyright Law. Some pictures are property of the individual photographers, as credited by each image. We deeply appreciate their generosity. All text is (c) copyright by Kyla Z. A. Dixon-Muir, as are all images not specifically credited to other photographers. Advance written permission is required for any use other than viewing on your computer screen. Please make an individual query only; do not add this address to any mass-communication lists. As we spend more time in the garden than on the internet, replies are generally made once weekly at best. Serious enquiries will include your name and phone number.